In past years, we’ve paid scant attention to the Whole Foods parking-lot version of the Subaru Impreza, concentrating more on its rowdier twin, the rally-bred WRX. 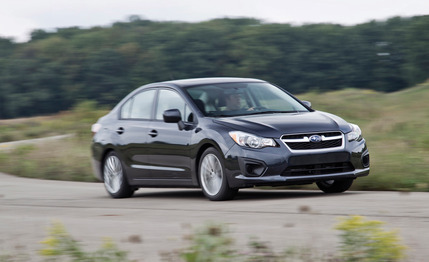 But for 2012, Subaru has made the basic Impreza more compelling, thanks to a thorough makeover. A Subaru spokesman confided that the two biggest knocks on the old Impreza were its sad styling and lousy fuel economy. So, Subaru addressed the former with a new wrapper (for both four-door-sedan and five-door-hatch versions) and the latter with a new, significantly more efficient driveline. The restyle has turned the Impreza sedan, like our test car, into a miniaturized version of the Legacy. And, like so many contemporary family sedans, the Impreza’s silhouette is roundy, almost fastbackish, with a short nose and a sharply raked windshield. Its otherwise smooth surfaces are crimped here and there with modeling around the wheel arches, defining lines along the hood, a simple hexagon of a grille, and a squared-off deck. The front corners are defined by wide squinty headlights and the rear by big, chrome-trimmed taillights. The Impreza’s look doesn’t pop, but it’s not unattractive.